Modern charcoal grill ovens are causing revolution in food preparation because people more and more appreciate tasty, succulent and aromatic food. It is important how food is prepared not just the fact that it is cooked and edible. Pit oven was the predecessor of outdoor grills in which bread was backed and later on everything else too. Stone and wood ovens developed into electric and gas oven like we know and use today. But the oven changed through time and now people are returning to wood and charcoal grills again. Increasing number of restaurants are offering delicious grilled food which is a natural way to prepare food. Stainless steel grill is used in restaurants which want to offer their customers properly grilled dishes. Because Kopa charcoal grill shortens whole food preparation process, tables in restaurants are served faster than before. Succulent dishes have unmistakeable grill aroma which is delicious. Use of charcoal is minimal and restaurant kitchens are heated less than they are with conventional charcoal grills. Benefits of stainless steel grill are: high quality food which pleases customers, cost efficient use and low price of charcoal, not dependent of gas and electricity fast return of investment, beautiful design of stainless steel oven allows it to be used in plain sight of customers, cooking display which is provided attracts new customers. Barbecue offers quick, reliable and simple use, they have low heat emissions and therefor better working conditions in kitchen, high capacity to size ratio. At the same time different type of food like meat, vegetables, fish, bread can be prepared in the oven. After meals, the oven can be on standby for next use, it has quick warming up to 30 minutes. Kopa grill oven is suitable for catering because it can be fitted with wheels for easy transportation. Company also provides devices for loading and unloading grill and to secure it during transport in vehicles. 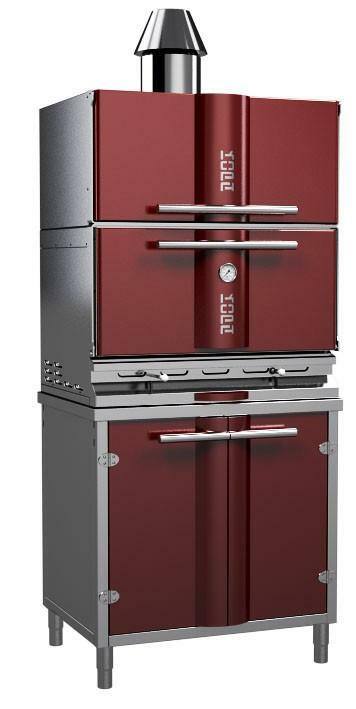 For home use Kopa grill oven is great because they make an average cook into a grill master. They always attract friends and neighbours and are a great excuse for outdoor parties at your home.